The most stylish sandals for next fall/winter 2013-14 are those signed MIUCCIA PRADA! There are 43 unique models: already object of desire for many fashionistas all over the world. Crocodile, suede and shiny leather to satisfy any requirement. 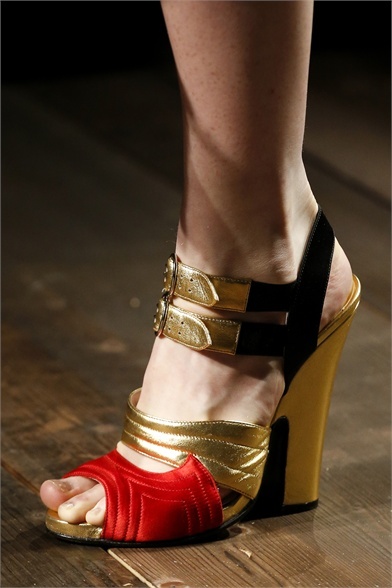 Non poteva che proporlo MIUCCIA PRADA il sandalo più di tendenza per la prossima stagione autunno inverno 2013-14! Ne esistono 43 modelli unici: già oggetto del desiderio di tutte le donne del mondo. Cocco, suède, pelle shinning per soddisfare tutte le esigenze! These heels are amazing! Loving the red, black and gold pair. Thanks for your kind visit, wish you well for the rest of the week! Thanks for recommandations. I like black and Silver.